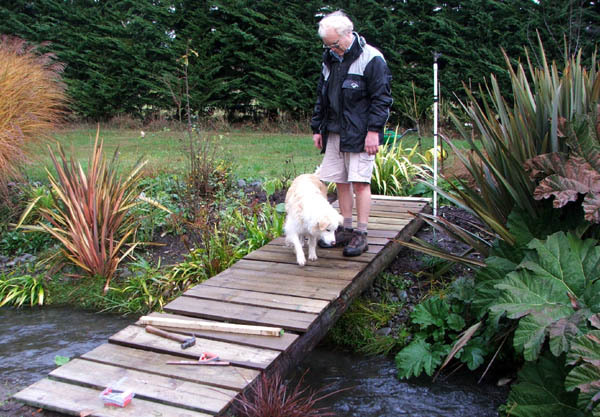 This last year I've spent weeks - months - trying to encourage Non-Gardening Partner to build me a Monet-style arched bridge. My journal is full of Monet-style moaning, I've sent him photographs of favourites found on my garden travels, and I've left folders full of images from gardening websites plainly open-to-view. I must have tried too hard, because he just wouldn't take the hint. Of course my head was full of non-budget botanical creations, ornamental beauties seen in the glory of summer. NGP's head, more wisely, had calculated the price of the timber needed. One frosty morning in early winter I saw sense. 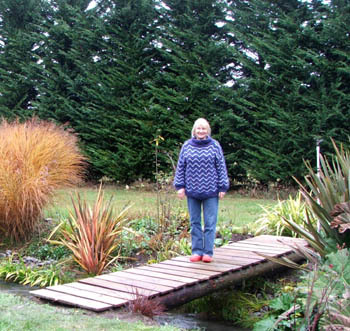 The Moosey garden isn't a botanical wonderland, and its bridges are used mainly by the Head Gardener, her gardening cats, and Rusty the red Border Collie dog. Moosey bridges have to be functional. That includes wheelbarrowing across them safely (if slowly) in a morning frost. A graceful glide up and over a slippery red-painted archway started to seem a little foolish - and farfetched. So Willow Bridge is the perfect compromise. It's flat and wheelbarrow-wide. But it's allowed to have some decorative handrails, just to appease any residual stylistic longings for Monet. The bridge starts at the open lawn by the Birthday Rose Garden and encourages the garden wanderer over the cold rushing water in the water race. 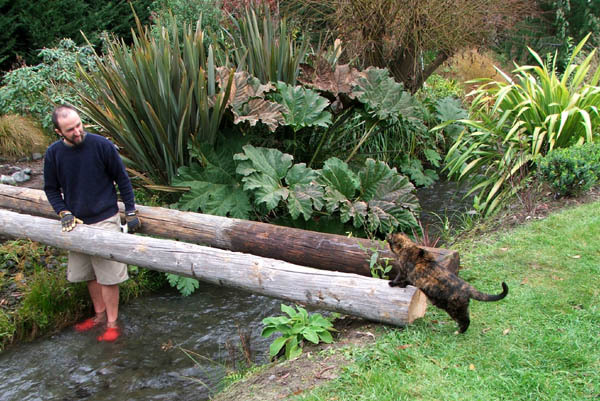 They'll end up spilling into the middle of the Willow Tree Garden near some giant Gunnera. Then they choose between a pair of stone-edged paths - turn left to pop out of the gardens, or turn right, duck and weave past the willow stump, flaxes and rhododendrons. They'll reach a small enclosed secret lawn with three blue garden seats, surrounded by flowers and greenery. It's the perfect place to sit and listen to the water rushing by. Rhododendrons and tree peonies bloom in spring, roses fill the borders in summer, and the most beautiful ornamental grasses and flaxes shine in autumn and winter. Nice spot! I love Willow Bridge. 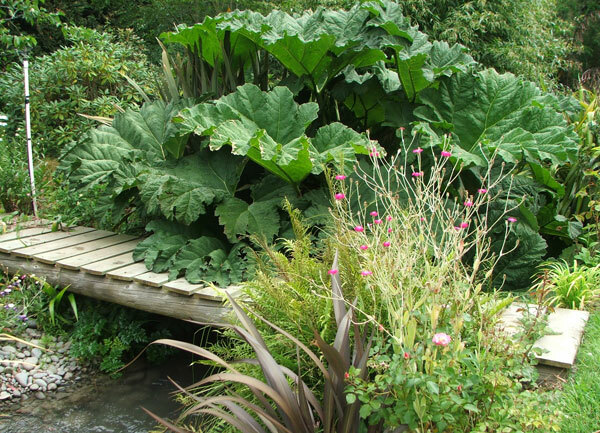 The gardens either side of the water race are joined up as one, and the waterside flaxes and self-planted Gunnera by the bridge have become instant sculptural features. It's a good look. Willow Bridge was put in place at the beginning of winter, 2008. Two five meter lengths of power pole are the supports, and new outdoor treated decking wood forms the walking surface. Thanks to the resident Moosey men for all the man-handling, and the littlest Moosey cats Mugsy and Lilli-Puss for christening the bridge. And thanks, Monet, but no thanks!